Have an incredible trip to the heart of the white washed villages. The tour will start in Seville where you will be picked up by a minibus and I will accompany you on the journey between Seville and Ronda. This will take 1 hour and a half. On our way to Ronda we will stop in Zahara de la Sierra with its beautiful lake . When we reach Ronda I will guide you through its most famous corners ; as I was born in this city I can take you around as if you were a local. I can take you under the most amazing bridge you have ever seen and take you through the gorge where I used to go when I was a child. 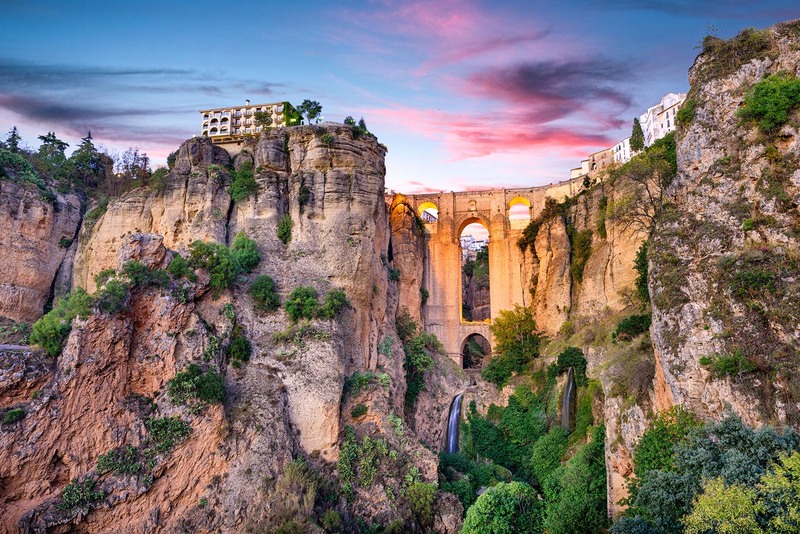 In the city of Ronda we can visit the Bullring as well as the New bridge. We will enjoy the best view of the bridge from the casa San Juan Bosco . You will have time as well to stop for a delicious lunch in one of the suggested places. On our way back we can stop in Setenil de las Bodegas to admire its incredible houses carved into the rocks.